Car accessories of all sorts include jazzy, fun and popular cartoon characters like Scooby-Doo. Scooby-Doo car accessories range from floor mats to air fresheners to license plates. Once you have decided you want to deck your ride with Scooby-Doo and found places that offer merchandise, you'll need to figure out exactly what pieces you want to include in you vehicle. Scooby has been around for more than a few decades, so some items may need to be purchased secondhand. How many accessories you use in the car depends on how far you want the theme to go. 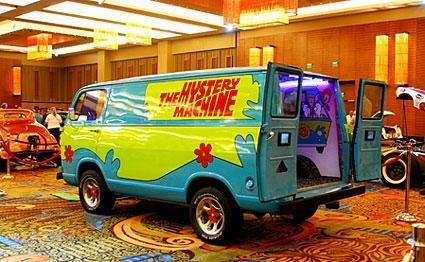 Pick out just a couple, like floor mats and a sun shade, to keep your Scooby theme subtle. True fans may find they can't get enough of this pup and pick up every accessory they can find. Whatever your preference, there is sure to be a few items featuring this famous face that will add some personality to your vehicle. Get a grip on your love of Scooby-Doo and a handle on your car when you pick up a steering wheel cover that features the famous dog. Amazon has an understated cover with the Scooby logo on it. Add front floor mats with Scooby's face to the driver and passenger sides. Make it a full theme by picking up matching mats for the backseat, too. Dealsinstore.com has a four-piece Scooby floor mat set featuring Scooby sticking out his tongue for the front mats and his name for the back mats. Get a Scooby rubber utility mat for the back seat that has his smiling face from Aum Auto. Let everyone who sees your ride know Scooby is your passenger by using a Scooby plate or license frame on your car. Speedy Pros offers a fun "What would Scooby-Doo do?" license plate frame on Amazon. iOffer has a large selection of Scooby-Doo license plates that are perfect to use in states where a front plate is not legally required. If you typically pull small trailers with your car, a hitch cover is a nice accessory to have that cleans up the look of your vehicle. Pick out with one Scooby's face and it's sure to be one that gets noticed. Custom Hitch Me has a hitch cover featuring Scooby's face on Amazon. Keep the sun out of your car and the temperatures down on hot summer days with a sun shade featuring Scooby, Shaggy and the entire gang. Make a custom car sun shade at PinkCarAccessoriesShop.com and choose Scooby as your logo before you check out. Aum Auto has a surfing Scooby theme reflective sun shade for sale. A bumper sticker with Scooby is a colorful way to show off your love of this character. Otherwise, a decal featuring Scooby's face in the back window is a great way to keep stickers off your car while still sharing your love of the dog. Sakari Graphics offers a simple outline decal of Scooby's head through Amazon. Everyone wants their cars to smell as good as they look, so why not combine the two? Look for a freshly scented air freshener featuring Scooby-Doo. Pick up a three pack of air fresheners featuring a wonderful winking Scooby at Kmart. Driving a car ranges from a necessity for work to a pleasurable pastime. Regardless of why or where you drive, make sure you bring Scooby-Doo along for the ride!